By integrating your communication processes into the HubSpot tool, you are able to track, respond, schedule, and even automate all customer communication. After you’ve set up your HubSpot portal and linked your email and other accounts to the tool, you are ready to begin streamlining and optimizing all your customer communication so nothing slips through the cracks! One of our favorite features for efficient client communication at i5 Web Design is the Meetings tool in HubSpot. You: Are you free on Monday to chat? Contact: No, I’m unavailable on Monday, how about Wednesday? You: I’m sorry, Wednesday doesn’t work for me, is there another day during the week you are free? Contact: I am free Tuesday at 3 and Thursday at 11. You: Okay, let me see if I can rearrange my schedule to accommodate that and I will get back to you! These exchanges are frustrating for both you and your contact. The HubSpot Meetings feature allows you to take away that whole exchange and provides a scheduling process that is convenient for both you and your customer. The Meetings feature connects with your Google or Office 365 Calendar and allows your contacts to book a time to speak with you based on what works best for them from the times you choose to have available for meetings. To set up your own Meetings link, you simply choose the times that you want to be available for meetings, choose how long you want your meetings to last, and set your preferences. These preferences include how much time you would like between meetings, what information you need from someone when booking a meeting, and more. Once you link is set up, you can send it to your contacts and allow them to choose their own time to meet with you from the times you are available. They can fill out their information and include a quick description of what they would like to talk about so you can be prepared. You can also create different Meeting links for different purposes. For example, you could have one link for contacts to schedule phone calls and a separate link for in-person meetings or presentations. 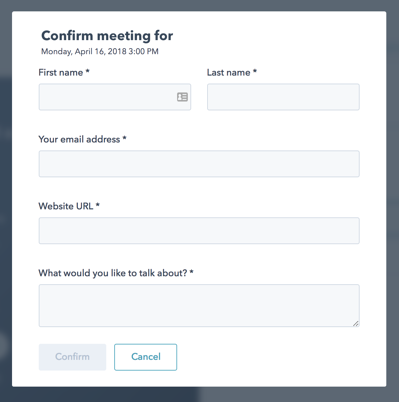 By using the meeting feature, you create a simple and convenient way for your contacts to get ahold of you and provide an open line of communication to your schedule and calendar. The Messages feature is another great way for you to be available and open for communication with visitors to your website. When you set up and enable the Messages feature, you can essentially have a live chat session with anyone who visits your website and has questions. Visitors can get real time answers and information from an actual person when visiting your site and you can even provide your Meeting link for them to schedule a time to discuss their questions further if needed. Within the Messages feature, it is very easy to customize the level of availability you would like to have for visitors to your site. 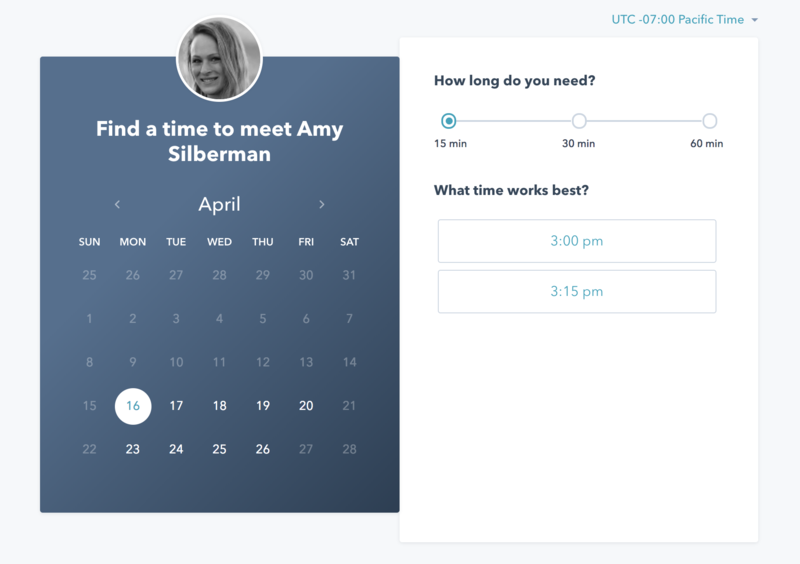 Similar to Meetings, you can set a schedule for when you will be Online or you can manually choose to be Online or Offline whenever you are available to chat. You can also choose which pages you would like your chat to appear on or even have different chat options for different pages on your website. 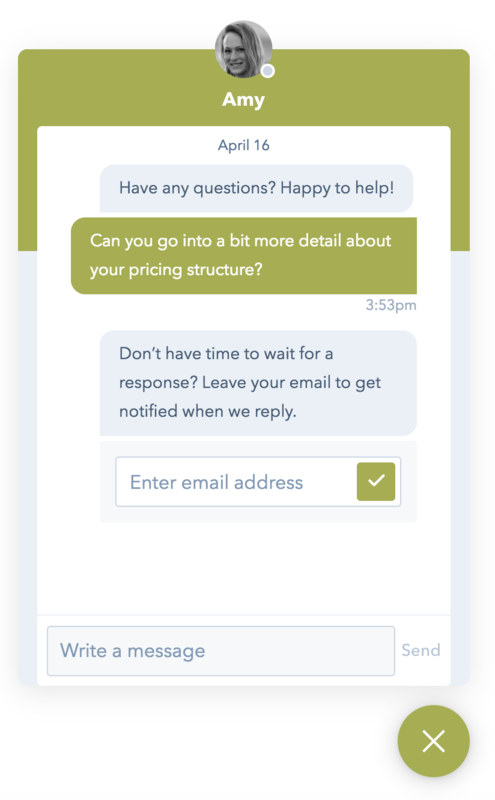 For example, on your pricing or services page you could have a prompt set to begin the chat asking if the visitor would like more information or had any questions about your service listings. However, on your contact us page you could have a prompt that offers a link to your Meetings calendar where they can instantly set up a time to talk with you over the phone. 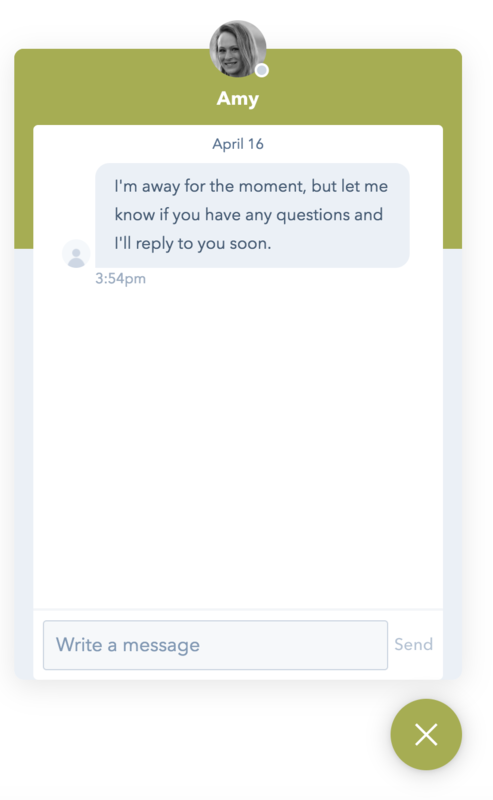 You can also let your visitors have the option to leave their email address for a more detailed answer or for a follow up response if you are away from the computer at the time of their question. By having this option available for communication with your visitors, you never have to miss out on a chance to educate or provide additional information and you create a new chance for communication with new and potential customers. The Workflows feature in HubSpot is another great way to ensure quick and simple communication with your contacts. When you use Workflows, you can automate responses to actions that your visitors take on your website, on an email, or more. This allows you to set up responses to these actions that will occur automatically, which will both save you time and ensure you never miss a chance at communicating with a visitor, lead, or customer. While there are many many uses for Workflows, both involving customer communication and internal actions, we have provided three examples that will create better communication from a sales standpoint, a marketing standpoint, and to increase your relationship with a current customer. Workflows can be used to nurture new leads who have visited your website or requested an offer. After the new leads have taken a specific action - in this case, we will use requesting a top of the funnel content offer, they will be entered into an automatic nurturing workflow. During this Workflow, they will receive the initial offer they requested. They will then continue to receive communication automatically at designated times starting from when they receive the offer (2 days, 5 days, 10 days, etc.). This communication is designed to guide them through the buyer’s journey and sends them content that is progressively more detailed. By performing this action in a Workflow, you can continually touch base with your contacts which will allow you to stay on their radar and not slip through the cracks while they’re progressing as leads. Workflows can also be used to to set tasks for yourself or a sales team. This is helpful to keep track of leads you need to contact either through email or by phone. For example if a lead schedules a free consultation or downloads a piece of content that indicates they are ready to be contacted, a Workflow can automatically set a task for a member of the sales team to follow up with the lead. The task can indicate if you need to call the lead or email them. It can also indicate which email template to use or set dates and times for follow up interactions. By using the Workflows to set tasks, you will be able to keep track of which leads need attention and when. Workflows can also be used once your leads become current customers. You can set up Workflows to ask your customers for reviews, send out satisfaction surveys, or even set up a referral program with incentives for your current customers. Just because your leads become customers does not mean the communication has to end. Workflows let you stay in communication with your contacts throughout the entire buyer’s journey while also saving you time and keeping everything in order. 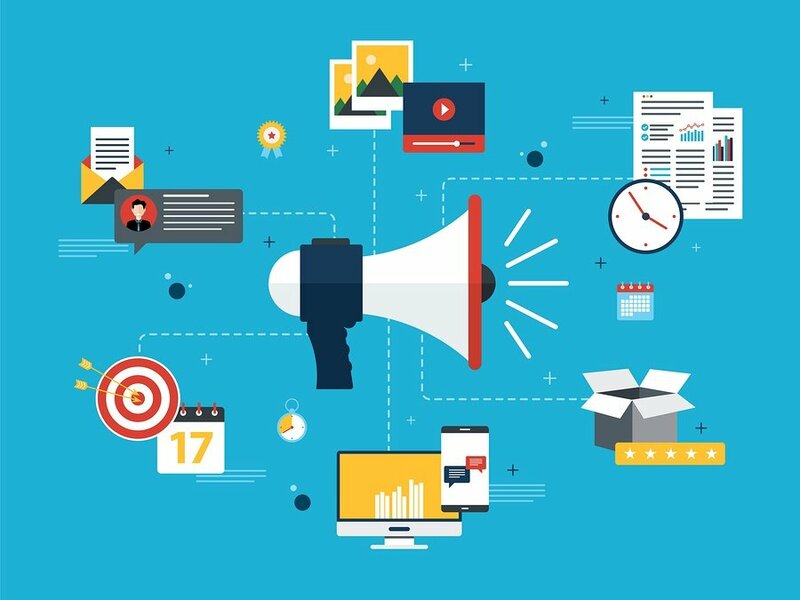 These are just a few of the ways HubSpot helps to improve your communication with your leads, customers, and other contacts. There are a number of other ways that the tool can help track and monitor contact communication, such as logging phone calls, emails, and more through the mobile app. We’ve discussed the steps you should take during your portal set up, which includes linking your email to your HubSpot account and using pre-set email templates and sequences to quickly communicate with your leads. All these ways and more are available in the tool for you to have quick, easy, and most importantly, trackable ways for you to improve your communication with your contacts and generate more new leads and sales. Are you interested in using the HubSpot tool to easily communicate with your customers? Request a free consultation to learn if HubSpot is right for you!